Tony McNicol and Yoshie Harimoto of WeDoJapan translated Professor Yoshifumi Miyazaki’s book Shinrin-yoku: The Japanese Way of Forest Bathing for Health and Relaxation for Octopus Publishing Group in late 2017/early 2018. They did an expert and professional job and truly went above and beyond the call of duty, aiding us in our communications with Miyazaki-san, which was a huge help and ensured that the project ran smoothly throughout. I thoroughly enjoyed working with Tony and Yoshie and would recommend them highly. 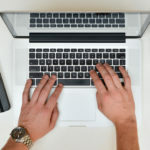 The quality and clarity of translation is key to the success of our products. I had worked with WeDoJapan in a previous role and been impressed with the quality of their output, so I didn’t hesitate to commission them. The service was as friendly as it was professional, and of course the translation was excellent. 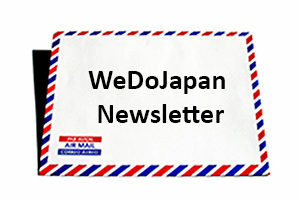 “Working with the team from WeDoJapan was really straightforward. We simply provided the text we needed translating and a couple of days later we had everything we needed, in the format required. As a growing international business based in London, it’s important for us to be able to create materials for our new markets without being contained by language barriers. We would be happy to recommend the service to others. 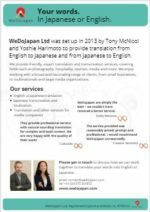 WeDoJapan are simply the best – we couldn’t have received a better service. Prompt, super efficient and proactive. It has been a pleasure to work with our translator, who seamlessly worked with a designer to bring our sales materials to life. We are delighted with the translation and design of our materials – which is so important to get right. We would recommend 100%. WeDoJapan translated a number of documents for me whilst I was on a business development trip to Japan in 2014. Since my area of practice, semiotics, does contain some unusual vocabulary, translating into Japanese was not always straightforward. However, the service provided was reasonably priced, prompt and professional. 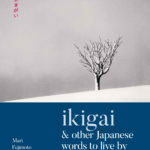 I would recommend WeDoJapan unreservedly.